AXA's mission is to help customers live their lives with more peace of mind by protecting them, their relatives and their property against risks, and by managing their savings and assets. As a company whose business is about protecting people, we have a responsibility to leverage our skills, resources and risk expertise to build a stronger and safer society. Our teams across the world are embracing five values we are not willing to compromise on, under any circumstance: Professionalism, Innovation, Pragmatism, Integrity and Team Spirit. In addition, three core attitudes (being available, attentive and reliable) guide all of our employees in better serving our clients to establish long-term relationships based on trust. 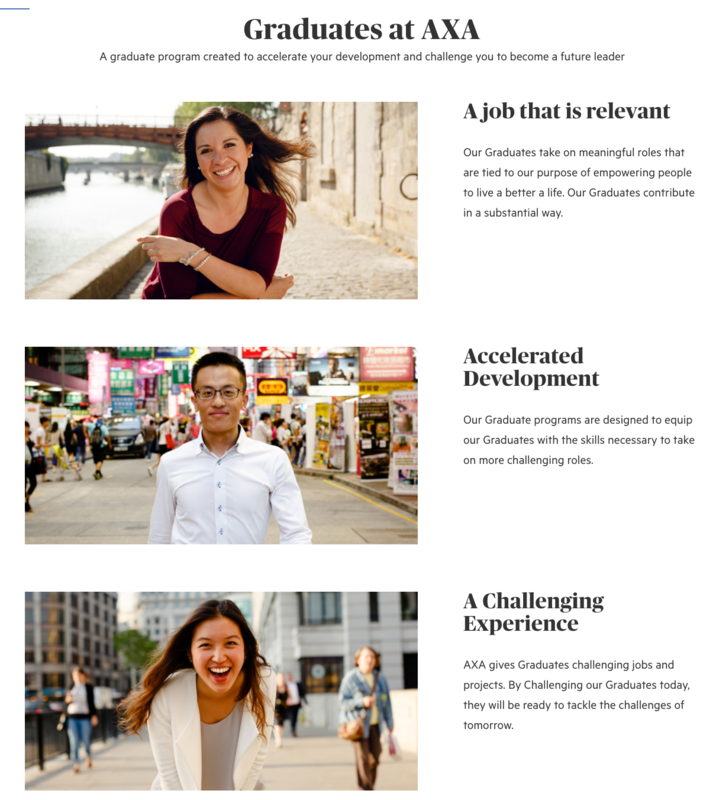 AXA Global Graduate Program - a structured graduate program which will enable you to develop the skills necessary to become a future leade. Understand AXA's business globally and locally. Get to know your team and your department. Hands-on exposure which will give you a real understanding of our clients, products and distribution channels. 3 days at one of AXA's global locations where you will gain a global overview of AXA, network with top management and with your peers. Enhance your leadership skills by being mentored by a senior leader and by being a reverse mentor. Strengthen your technical skills through learning programs that are in line with your individual development needs. Continue to network with your global graduate community.